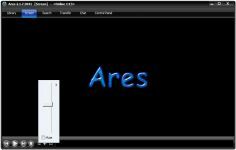 Ares is a client for "peer-to-peer" which allows to share audio, video, image, as well as software, documents and more. It is a video and audio player, making it is possible to know the contents of a file without using third party software. It also allows to listen to Shoutcast online radio. Manager playlist is also available. Being a a P2P client for the network of the same name, Ares has an intuitive graphical interface that facilitates the grip and allows to automatically find the fastest and most reliable networks to download a file with no configuration required for its first start . With this application users can communicate by instant messaging; this feature allows multiple users to communicate with each other by creating their own chat or joining existing ones. The application also allows to create multiple folders to organize files for a better organization. Curently we don't have any log information about Ares version 2.4.9. We will this change log update soon!